Stalagg was added in the Curse of Naxxramas Adventure. He is available from Wing 4 - The Construct Quarter which opened on August 12th, 2014, and is obtained after defeating the adventure boss Thaddius. Stalagg combos with Feugen to summon Thaddius. If the first Feugen or Stalagg is silenced, they still count as dying for future Feugen or Stalaggs. Need help conquering the Curse of Naxxramas Adventure to obtain Stalagg? Head on over to our Curse of Naxxramas Adventure Guide! This happened to me last night (not exact, but close). Mind Vision #1 copies one of the triplets (let's say this one, for the sake of conversation) from my opponent, #2 copies Sylvanas Windrunner. Both Stalaggs die in battle, Feugen comes up for my opponent after I've already played Sylvana, he kills her (and kills Feugen in the process), Thaddius is the only one left on his side of the board and dying Sylvana takes him. What happens if you play one of these guys and your opponent plays the other and they both died? Does it still summon Thaddius and who gets him? Also, this would be REALLY fun with Baron Rivendare. Two 11/11s? Ow. In short, yr screwed if u put yr in play first. I hope I got the understanding correct. Edited: On 2nd thought, I do have doubt after double reading the latest rules, if Deathrattles is only to be triggered after all damage assigned and minions destroyed, then they should both read each other. I can confirm that if you play against an opponent who also has these cards, the order of play is important. 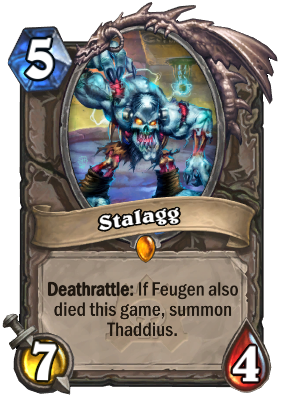 If you were to attack Fuegen with Stalagg and both die at the same time, your opponent will get Thaddius and you'll get nothing. However later in the game you can play Fuegen and when he dies, you will get a Thaddius. 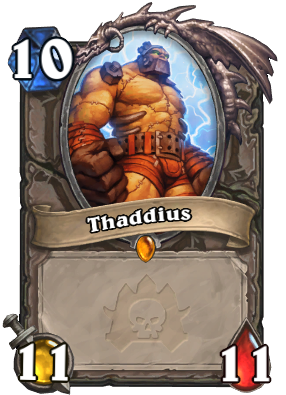 Even later, your opponent plays Stalagg and if he were to die, he would also get a Thaddius. However you happen to have a silence and use it before you kill him, you would prevent another Thaddius from spawning. You play Stalagg and your opponent silences him before killing him. Later you play Fuegen and he dies. You will Summon Thaddius unless he is silence before being killed. TLDR; you only need to silence the second of the pair that dies to prevent Thaddius from being summoned. Stalagg is one of two rewards for completing the Construct Quarter in the Curse of Naxxramas Adventure. The other is Feugen.